What do you think about the “largest point decline in history” ?!? Last Monday certainly wasn’t fun for anyone watching their portfolio but if you put things into perspective what you end up with was the 138th largest percentage drop for the S&P 500. The financial media predictably goes bonkers when reporting numbers and this fuels the fire for the average investor. Our beef with them isn’t even the “sky is falling” antics which happen on any big volume or down day but the fact that they skew reality. We’re not trying to minimize the strong move or the fact that we’re finally seeing volatility back in the markets but keep your common sense hat on when digesting the results. First and foremost, when an index like the Dow Jones is almost at 27,000 points, simple math shows that a -5% drop will equate to about -1,350 points. 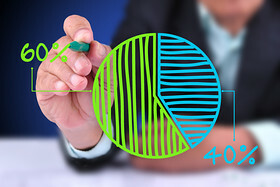 A five percent pullback is not only par for the course but as we mentioned in our most recent article…very much needed and of course long overdue. With a total of just over -10% we finally have (by definition) reached a correction. Who knows what Mr. Market has in store for us tomorrow but one thing we can almost guarantee you is that the financial media will be far more excited about it than anyone needs to be. Hysterics and click bait sells more than a rational report explaining stock market action that is actually not unusual nor completely out of historic proportion. Speaking of reports…we invite you to read this special update on our Columbus Strategy. Click here to read the Columbus Strategy -2018 Stock Market Volatility Report. What matters most in times like this is to level set things and to have a disciplined strategy firmly in place. Our signature approach for accounts over $100k is the Columbus Strategy and aside from its long-term track record what gives many clients some peace of mind is knowing that it ultimately looks to mitigate large and extended stock market drawdowns. We’re not so much focused on one month but over the course of a full market cycle you will be hard pressed to find a strategy that does better. Nobody can consistently time the market but there are certain tactical adjustments that can be made to at least avoid longer stretches of market chaos. If we were to be visibly headed for a recession our stance on this recent correction would be much different than it is now. For the time being we’re approaching this correction exactly like we should be since it’s not our first rodeo; we’re nibbling at positions that we’ve wanted to add to and rebalancing any allocations that are not in line with a portfolio’s respective strategy. Other than that the absolute worst thing you can do right now is act human! While that sounds crass we’re simply reminding you that people tend to have short memories and get way too emotional. If you want more information on our Columbus Strategy please contact us. Beyond that we will leave you with a quote and saying that we came up with many stock market corrections ago…. “Stay disciplined to stay positive”. Like clockwork you set us up for another stretch of pretending that you wanted to inch up higher and then sold off the last week of the month. How you behaved in May is similar to what you did in June except this time your volatile temper began to show more of a resolve and rattled investors. You began the month with some semi-positive economic news along with dovish Fed commentary all to have it dampened by the Greek debt fiasco. The S&P 500 lost -2.17% for the month of June. The poor performance turned in by our domestic markets pales in comparison to what has transpired in China. If you’re waiting for another proverbial “bubble” to burst…perhaps it’s here. In about three weeks Chinese stocks sold off sharply losing -30%. We’ll talk more about this later in this article but for those “experts” claiming that this is a good time to buy Chinese stocks, consider the reality that they are still quite expensive. If you think our markets are frothy after a six-year bull market run and a current P/E ratio of 20.5, the median P/E ratio for Chinese companies is still at 55 (down from 108!). Here’s the current summary of the MPG Core Tactical 60/40 portfolio mix, which is updated as of this writing (July 2, 2015). Click here to compare our portfolio against the benchmark. The financial media loves to move from crisis to crisis and spice things up by creating eye-catching headlines! Over the course of the last few months an old friend has popped back up as the lead story and it isn’t due to being the birthplace of the Olympics or tasty baklava. Greece is once again in a financial crisis and its future will not only impact Europe but also economies around the world. 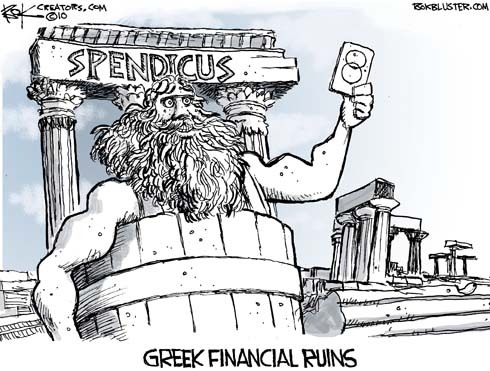 While the issue is complex and there are many moving pieces what it ultimately comes down to is Greece has a spending problem. The country is like a college freshman that just got their first credit card and has gone on spending spree oblivious to any repercussions. Picture that freshman opening their first bill after they have decked out their dorm room and realizing they can’t make even the minimum payment. This is the dilemma that Greece is facing… again!